(SitNews) Ketchikan, Alaska – U.S. Senators Mark Begich (D-AK) and Lisa Murkowski (R-AK) introduced a bill late last Thursday which would help ensure the long term presence of the National Oceanic and Atmospheric Administration (NOAA) in Ketchikan. The bill would authorize NOAA to sell the port facility it currently owns at 1010 Stedman Street, which used to be a Tesoro fuel dock, and utilize the proceeds of the sale towards a new facility located elsewhere in Ketchikan. The current facility, which serves as the homeport for the NOAA Ship Fairweather, was condemned as unsafe in 2008, and the ship has been without an Alaska homeport facility since. With its multi-beam sonars and suite of specially-equipped launches, the technologically-advanced Fairweather is one of the most productive platforms in the world for making nautical charts. 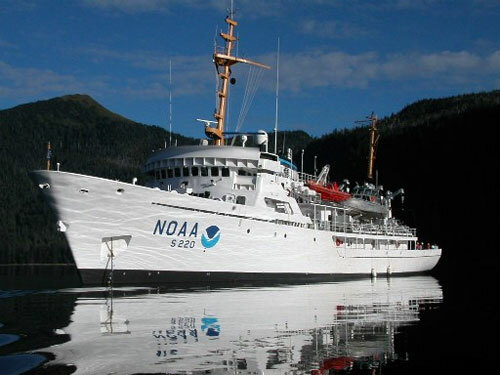 The NOAA Ship Fairweather is a hydrographic survey ship that was originally commissioned with NOAA in 1968. The ship was deactivated in 1989 but a critical backlog of surveys for nautical charts in Alaska was a motivating factor to reactivate the ship in 2004. Bringing the NOAA Ship Fairweather home to Ketchikan will help the effort by the community to develop Ketchikan as a maritime center for the Northern Pacific Ocean. The Alaska Marine Highway System is also planning a major relocation to Ward Cove, and it is hoped there will be enough demand for repairs and supplies to support more specialized marine contractors and merchants in Ketchikan. Having that infrastructure will help attract more maritime-related business to the area, positioning Ketchikan to be a major maritime hub. Sen. Begich has been encouraging NOAA to cooperate with the Alaska Marine Highway System as both organizations plan their facilities. He met with NOAA and Alaska Marine Highway Officials this spring in Ketchikan to discuss a partnership to redevelop the area and a new dock. “It doesn’t make sense to have one government entity building a major facility at one end of town, and another building a similar facility at the other end. Hopefully the Marine Highway System and NOAA can cooperate, eliminate redundancies, and save some taxpayer dollars,” Begich added. One of the Fairweather’s most important contributions to Alaskan and national policy has been its ability to map waters that are being trafficked more, due to increasing sea ice. Last Summer, it surveyed 350 square nautical miles in the Bering Straits to determine ocean depth and gather essential fish habitat information. Alaska State Sen. Bert Stedman (R-Sitka) said the bill is great news for the area.